NORTHBROOK, Ill., June 25, 2015 /3BL Media/ – Astellas demonstrated support of its lesbian, gay, bisexual, transgender and questioning (LGBTQ) employees, communities and issues by flying the Pride Flag at its headquarters for the Americas in June, participating for the sixth year in the Chicago Pride Fest parade and hosting an educational session with anti-bullying leaders, Jane and James Clementi, from the Tyler Clementi Foundation. "As an employer of choice, we pride ourselves in creating a diverse and inclusive culture that helps ignite innovation throughout the organization,” said Linda Friedman, senior vice president, general counsel and the executive sponsor of “TAO - Together As One,” Astellas’ LGBTQ employee resource group. 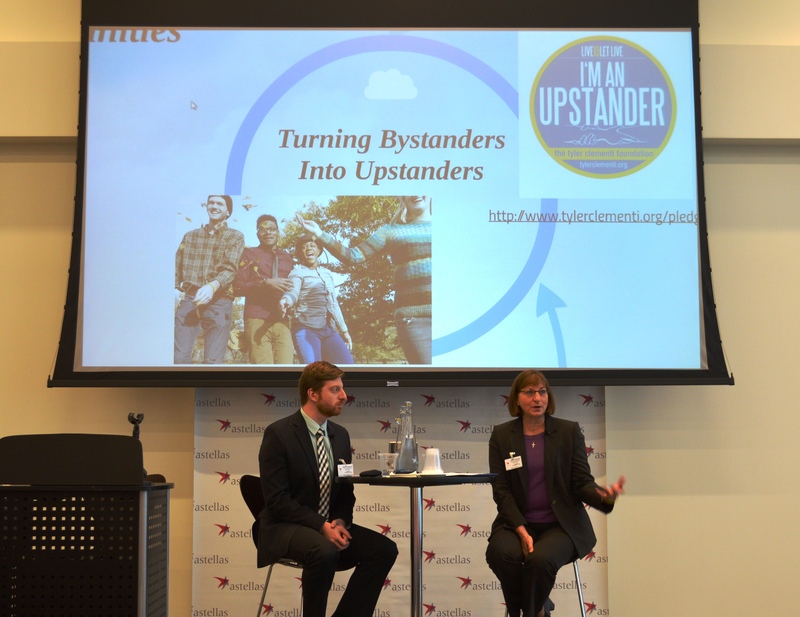 On June 25, guest speakers Jane and James Clementi of the Tyler Clementi Foundation spoke to hundreds of employees live and via webcast about their new #Day1 campaign that aims to stop bullying in schools, workplaces and faith communities. The nonprofit organization—recently featured on CBS Sunday Morning and in USA Today—was founded in memory of their son and brother, Tyler, who was lost to youth suicide. The launch of the #Day1 campaign commemorates the fifth anniversary of Tyler's tragic death, as it approaches this September 22. On June 28, over 150 Astellas employees and their family members donning pride t-shirts will participate in the 46th annual Chicago Pride Parade walking alongside the Astellas corporate float. Astellas also hosted a booth on June 20-21 at the Chicago Pride Fest street fair to help educate attendees on the resources available for at-risk youth in the LGBTQ community. Astellas recently received a perfect score on the Human Rights Campaign’s annual Corporate Equality Index (CEI). The CEI is a national benchmarking tool used to rate companies on policies and practices concerning lesbian, gay, bisexual and transgender employee equality.